As I've received numerous flattering compliments about this particular necklace I'm going to say a little bit on it! This piece has a very delicate appearance. 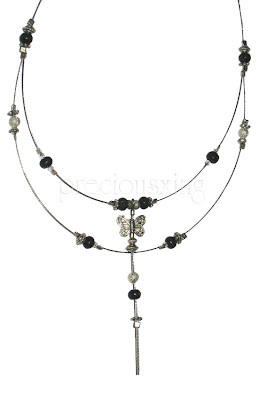 Wooden, stardust and Indian/Bali beads on tiger's tail compose the majority of the necklace. 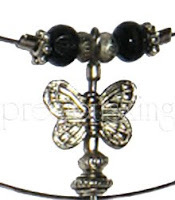 The butterfly sits on an extension of tiger's tail hanging from the upper row of beads. This necklace also has a matching bracelet (though either go well on their own). 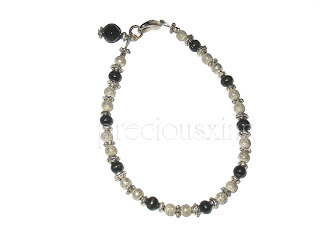 The bracelet uses the same beads, just many more! ^.^ This unique elegant design is great for wearing formally or casually.